The wide spectrum of clinical outcomes following infection with Mycobacterium tuberculosis is largely determined by the host immune response; therefore, we studied several clinically defined groups of individuals (n = 120) that differ in their ability to contain the bacillus. To quantitate M. tuberculosis-specific T cells directly ex vivo, we enumerated IFN-γ-secreting CD4 T cells specific for ESAT-6, a secreted Ag that is highly specific for M. tuberculosis, and a target of protective immune responses in animal models. We found that frequencies of circulating ESAT-6 peptide-specific IFN-γ-secreting CD4 T cells were higher in latently infected healthy contacts and subjects with minimal disease and low bacterial burdens than in patients with culture-positive active pulmonary tuberculosis (p = 0.009 and p = 0.002, respectively). Importantly, the frequency of these Ag-specific CD4 T cells fell progressively in all groups with treatment (p = 0.005), suggesting that the lower responses in patients with more extensive disease were not due to tuberculosis-induced immune suppression. This population of M. tuberculosis Ag-specific Th1-type CD4 T cells appears to correlate with clinical phenotype and declines during successful therapy; these features are consistent with a role for these T cells in the containment of M. tuberculosis in vivo. Such findings may assist in the design and evaluation of novel tuberculosis vaccine candidates. An understanding of protective immune responses in humans is essential for the rational development and clinical testing of new, effective vaccines against tuberculosis. It is therefore important to understand the quantitative relationship between host responses and disease and to identify which Ag-specific T cell populations contribute to protective immunity. In murine models, MHC class II-restricted CD4 T cells (1), MHC class I-restricted CD8 T cells (2, 3), IFN-γ (4), and TNF-α (5) are essential for protection. In humans, various subsets of CD8 T cells have been identified (6, 7, 8, 9, 10), but their role in containment of Mycobacterium tuberculosis infection remains uncertain (11). In contrast, the greatly increased risk of active tuberculosis caused by HIV infection (12), and other observations (11, 13, 14), point to a crucial role for Th1-type CD4 T cells. Selection of Ags for inclusion in novel subunit vaccines depends upon identifying the targets of protective immunity in vivo, yet little is known about the Ags targeted by protective immune responses in humans. In rodent models, secreted Ags are the predominant targets of protective immunity (15), and vaccination with secreted Ags can confer protection (16, 17). ESAT-6, a secreted Ag that is highly specific for the M. tuberculosis complex, is a major target of IFN-γ-secreting CD4 T cells in the memory immune mouse model (15), and immunization with ESAT-6 induces protective immunity against tuberculosis (17, 18), which is mediated by ESAT-6 peptide-specific IFN-γ-secreting CD4 T cells (18). In humans, the recent observation that ESAT-6 is recognized by a large proportion of patients with active tuberculosis (19, 20, 21, 22), together with the absence of ESAT-6 from Mycobacterium bovis bacillus Calmette-Guérin (BCG)3 (23, 24), has generated much interest in this Ag as a diagnostic reagent. However, it is not yet known whether, as in murine models, ESAT-6 is a target of T cells with a protective role in vivo. Given the important role of CD4 T cells and IFN-γ in tuberculosis, we asked whether the levels of ESAT-6-specific IFN-γ-secreting CD4 T cells correlate with clinical phenotype in humans. Importantly, the highly restricted species specificity of ESAT-6 means that T cell responses to this Ag are M. tuberculosis specific and not a result of cross-reactivity with BCG vaccination (20, 25). The result of infection with M. tuberculosis is determined largely by the host immune response. The clinical outcome ranges from asymptomatic latent infection associated with long-term immunological control of the bacillus (healthy contacts), through mild forms of disease with minimal symptoms, frequent spontaneous resolution, and low bacterial burdens (e.g., tuberculous lymphadenitis), to sputum smear-positive pulmonary tuberculosis with severe symptoms, extensive disease, and high bacillary loads. This wide spectrum of clinical phenotypes offers the opportunity to investigate the relationship between immune responses and the degree of containment of the bacillus in vivo. Using conventional T cell assays that rely on Ag-driven proliferation in vitro, weaker responses have sometimes been found in patients with more extensive disease (26, 27, 28). This probably reflects nonspecific suppression of cellular immune responses during active tuberculosis, which recover with therapy (28, 29, 30). We reasoned that direct enumeration of Ag-specific T cells from peripheral blood, without an in vitro proliferation step, would delineate a more physiologically relevant immune response and might be less susceptible to the nonspecific immune suppression resulting from tuberculosis itself. This direct ex vivo approach has recently provided important insights into the protective role of Ag-specific CD8 and CD4 T cells in chronic viral infections, including HIV, hepatitis B virus, and EBV (31, 32, 33, 34, 35, 36). We therefore used the sensitive ex vivo ELISPOT assay for IFN-γ (33, 37, 38) to directly quantitate IFN-γ-secreting CD4 T cells specific for a panel of overlapping peptides spanning the ESAT-6 molecule. We studied five precisely clinically defined groups of individuals: tuberculin skin test (TST)-positive healthy household contacts (HHCs) of sputum smear-positive tuberculosis cases, patients with tuberculous lymphadenitis (TBLN), patients with self-healed culture-negative pulmonary tuberculosis (C−PTB), patients with culture-positive pulmonary tuberculosis (C+PTB), and healthy unexposed controls (UCs). The quantitative readout of the ex vivo ELISPOT assay permitted meaningful comparisons of ESAT-6-specific T cell frequencies between these groups and, in some individuals, we longitudinally tracked these Ag-specific T cells during treatment. Adult patients and contacts were recruited prospectively at Northwick Park Hospital (London, U.K.) and the hospitals of the Oxford Radcliffe National Health Service Trust (Oxford, U.K.). Ethical approval for the study was granted by the Harrow and Central Oxford Research Ethics Committees. A heparinized blood sample was drawn after obtaining informed consent. No subjects had features of HIV infection, and patients known to be HIV infected were excluded. Demographic characteristics are shown in Table I⇓. Twenty-seven HHCs were recruited on the basis of the following criteria. All had lived in the same household as an index case of untreated sputum smear-positive pulmonary tuberculosis within the last 6 mo, were asymptomatic, and had normal chest radiography. In addition, all HHCs had strongly positive TSTs (Heaf grade 3 or 4), which were performed by standardized multiple puncture tuberculin skin testing with a six-needle disposable head Heaf gun (Bignall 2000; Bignall Surgical Instruments, Littlehampton, U.K.) and concentrated purified protein derivative (PPD) 100,000 tuberculin U/ml (Evans Medical, Liverpool, U.K.), in accordance with U.K. guidelines for evaluation of tuberculosis contacts. Twenty-three HHCs had been BCG vaccinated, and none developed tuberculosis over a 12-mo period of follow-up. None had received chemoprophylaxis at the time of venepuncture. Thirty-two healthy UCs with no history of tuberculosis and no known tuberculosis contact were recruited prospectively. Most were laboratory staff, and 28 had been BCG vaccinated. 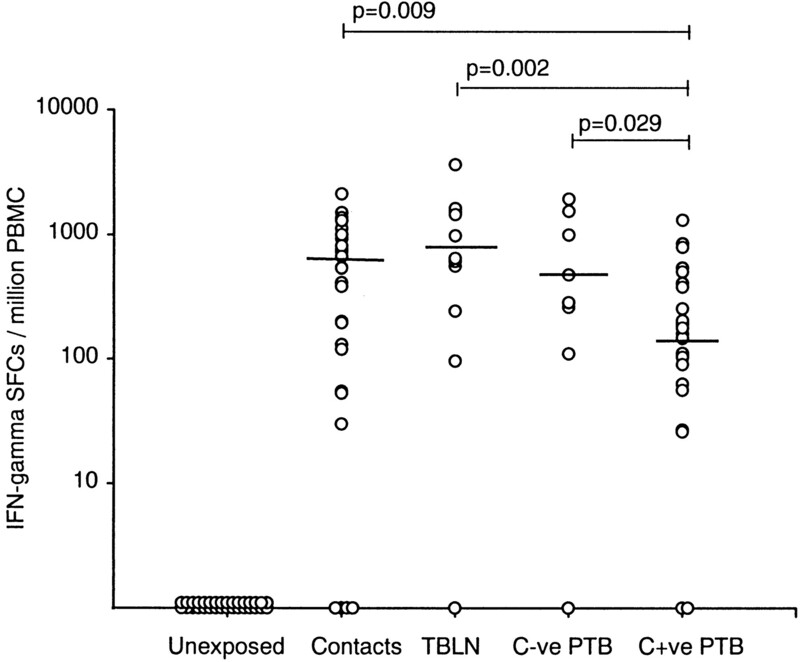 Twenty-five patients with C+PTB had clinical and radiographic findings consistent with tuberculosis and positive cultures for M. tuberculosis from one or more respiratory specimens. Eighteen of twenty-five (72%) PTB patients had received either no therapy, or less than 4 wk of therapy at the time of venepuncture. Eight patients with self-healed C−PTB had a clinical diagnosis made on the basis of highly suggestive appearances on chest radiography and positive tuberculin skin tests. All were asymptomatic and had no previous history of treatment for tuberculosis. All respiratory samples, which consisted of three sputum specimens (or three gastric washings in the absence of productive cough) and a bronchoalveolar lavage for each patient, were negative for M. tuberculosis culture. Six of eight (75%) of this group had received either no therapy, or less than 4 wk of therapy. Eleven patients with TBLN had consistent clinical findings, positive TSTs, and a good response to antituberculous chemotherapy. Seven had lymph node biopsies, of which five grew M. tuberculosis on culture. Five of eleven (45%) TBLN patients had received either no therapy, or less than 4 wk of therapy at the time of venepuncture. Seventeen patients with nonlymph node extrapulmonary tuberculosis (EPTB) were recruited on the basis of clinical findings and positive cultures for M. tuberculosis from one or more clinical specimens. Four patients had tuberculous osteomyelitis, two had musculoskeletal tuberculosis (psoas abscess), four had pleural disease, three had miliary disease, three had abdominal disease, and one had meningitis. The small number of patients precluded statistical comparisons of T cell frequencies between the subgroups of EPTB. Seventeen peptides spanning the length of the ESAT-6 molecule were synthesized by solid-phase F-moc chemistry (Research Genetics, Huntsville, AL). Each peptide was 15 aa in length and overlapped its adjacent peptide by 10 residues. Identity was confirmed by mass spectrometry, and purity by HPLC. Sequence homology searches of the SwissProt and translated GenBank protein databases confirmed that these peptides are uniquely restricted to the ESAT-6 protein of M. tuberculosis complex. PBMC were separated from 20 ml blood by Ficoll gradient centrifugation and suspended in RPMI supplemented with 2 mM l-glutamine, 100 μg/ml ampicillin, 50 μg/ml gentamicin, 1 mM sodium pyruvate, and 10% heat-inactivated FCS (Sigma, St. Louis, MO) (R10). As previously described (7, 37), 96-well polyvinylidene difluoride-backed plates (MAIPS45; Millipore, Bedford, MA), precoated with 15 μg/ml anti-IFN-γ mAb 1-D1K (Mabtech, Stockholm, Sweden), were blocked with R10 for 2 h. A total of 3 × 105 PBMC was added in 100 μl R10/well, and peptides were added individually to single wells at 10 μg/ml. PPD (batch RT49; Statens Seruminstitut, Copenhagen, Denmark) was also tested at 20 μg/ml. PHA (ICN Biomedicals, Aurora, OH) at 5 μg/ml was added to duplicate positive control wells, and no peptide to duplicate negative control wells. rESAT-6 (a kind gift of A. Whalen and M. Vordermeier, VLA, Addlestone, U.K.) was added to single wells at 10 μg/ml for 35 subjects. After 14-h incubation at 37°C, 5% CO2 plates were washed with PBS 0.05% Tween 20 (Sigma). Fifty microliters of 1 μg/ml biotinylated anti-IFN-γ mAb, 7-B6-1 biotin (Mabtech), were added. After 2 h, plates were washed, and streptavidin-alkaline phosphatase conjugate (Mabtech) was added to 1:1000. After 1 h and further washing, 50 μl diluted chromogenic alkaline phosphatase substrate (Bio-Rad, Hercules, CA) was added. After 20 min, plates were washed and allowed to dry. These assays were conducted as described above using high affinity IL-4-specific Abs (IL-4-I catcher and biotinylated IL-4-II detector; Mabtech) and a 60-h incubation period. IFN-γ SFCs were counted using a magnifying glass, and responses were scored as positive if test wells contained at least five IFN-γ SFCs more than negative control wells, and this number was at least twice that in negative control wells. This cutoff (five IFN-γ SFCs per 3 × 105 PBMC) translates into a detection threshold of 1/60,000 PBMC. The person performing and reading the assays was blinded to the clinical status of the different groups of patients and HHCs, but not to the UCs. Background numbers of SFCs in negative control wells were below five. After subtraction of background values, the number of IFN-γ SFCs specific for each peptide was summated, and this total number of ESAT-6 peptide-specific SFCs for a given individual was used for comparisons between groups of subjects and between different time points during treatment of individual patients. T cell lines were generated as previously described (7). Briefly, PBMC were suspended at 5 × 105 cells/ml in AB medium (RPMI supplemented with 2 mM l-glutamine, 100 μg/ml ampicillin, 5 μg/ml gentamicin, and 10% heat-inactivated pooled human AB serum; National Blood Transfusion Service, Bristol, U.K.), and 200 μl was added per well in a round-bottom 96-well plate. Peptide was added at 10 μg/ml. A total of 10 U/ml IL-2 in the form of Lymphocult-T (Biotest, Dreiech, Germany) was added every 3 days. After 12 days, T cell lines were immunomagnetically depleted and tested against the stimulating peptide in duplicate wells in ELISPOT assays for IFN-γ using 1–5 × 104 cells/well. CD4 and CD8 T cells were depleted from T cell lines by 30-min incubation with anti-CD4 or anti-CD8 mAbs conjugated to ferrous beads at a ratio of 10 beads to 1 cell using Dynabeads M-450 (Dynal, Oslo, Norway) in 200 μl R10 on ice. Following dilution in R10, the conjugate-coated cells were removed by a magnet (Dynal). These Dynabeads reliably deplete >99% of the target cell population. A total of 2 × 105 PBMC was seeded per well in 200 μl AB medium in 96-well round-bottom plates. Peptides were added at 10 μg/ml, negative control wells had medium only, and positive control wells contained PPD at 20 μg/ml. All conditions were set up in triplicate wells. Following incubation at 37°C, 5% CO2 for 5 days, 1 μCi [3H]thymidine was added to each well. After 18 h, wells were harvested, and [3H]thymidine incorporation was measured in a beta counter (Wallac; PerkinElmer Life Sciences, Cambridge, U.K.). Results were scored as positive if the stimulation index was 3 or more. HLA class II restriction of the CD4 T cell response to two immunodominant peptides, ESAT-61–15 and ESAT-671–85, was investigated using T cell lines as well as ex vivo PBMC. The murine mAbs L243, L2, and B7.21, which block peptide presentation to CD4 T cells by HLA-DR, HLA-DQ, and HLA-DP, respectively, were added at 10 μg/ml to three separate pairs of duplicate wells in ELISPOT assays, followed by 10 μg/ml peptide 90 min later. Control duplicate wells received peptide only, or neither peptide nor Ab. Summated frequencies of ESAT-6 peptide-specific IFN-γ SFCs for responders were compared between patient groups using the nonparametric Mann-Whitney test (two tailed), and between the first and last time points sampled in the treatment course of individual patients using the nonparametric Wilcoxon signed rank test (two tailed). The proportional decrease in Ag-specific T cell frequencies during therapy was calculated using the Student’s t test on log transformed data. ESAT-6 peptide-specific IFN-γ-secreting T cells were detected in almost all tuberculosis patients and the majority of contacts. Responses were observed in 10 of 11 TBLN patients, 7 of 8 C−PTB patients, 23 of 25 C+PTB patients, and 23 of 27 HHCs (Table I⇑). It is possible that the four HHCs who did not respond to ESAT-6 were not infected with M. tuberculosis; their positive TSTs may have resulted from prior BCG vaccination. By contrast, none of the 32 UCs (of whom 28 were BCG vaccinated) responded to ESAT-6 peptides in the ex vivo ELISPOT assay for IFN-γ (Table I⇑), consistent with ESAT-6-specific responses being M. tuberculosis specific. Frequencies of ESAT-6 peptide-specific IFN-γ-secreting T cells for all responders from each group are shown in Fig. 1⇓ and summarized in Table I⇑. For the HHCs that responded to ESAT-6 (n = 23), frequencies of ESAT-6-specific T cells were significantly higher (p = 0.009) than among the C+PTB patients who responded (n = 23) and higher (p = 0.044) than the PTB (C+ and C−) group as a whole (n = 30). Both groups of ESAT-6-responsive patients with minimal, paucibacillary disease, TBLN (n = 10) and C−PTB (n = 7), also had significantly higher frequencies of ESAT-6 peptide-specific T cells than the C+PTB patients (p = 0.002 and p = 0.029, respectively). The range of ESAT-6-specific T cell frequencies within each patient group is broad and probably reflects the natural range of interindividual variability for such responses. Frequencies of ESAT-6 peptide-specific IFN-γ-secreting T cells for the five different groups of subjects. Each circle represents an individual subject; the frequency of IFN-γ-secreting T cells to each peptide was summated to give the total number of ESAT-6 peptide-specific T cells. The vast majority of tuberculosis contacts and patients responded (Table II⇓). The horizontal bars represent the median frequency of ESAT-6 peptide-specific T cells for the responders in each group, and the p values are for the difference between the responders in each of the patient groups. If lower frequencies of ESAT-6-specific IFN-γ-secreting T cells in patients with active C+PTB were a result of nonspecific disease-associated immunosuppression, T cell frequencies would be expected to rise during effective treatment. We therefore longitudinally tracked 12 patients (4 C+PTB, 3 TBLN, and 5 EPTB) on antituberculous chemotherapy and observed a decline in the overall frequency of ESAT-6 peptide-specific T cells (p = 0.005) (Fig. 2⇓). The average decrease over the mean follow-up period of 18.6 wk was by a factor of 0.62 95% confidence interval (CI), 0.37–0.76), that is, to 38% of the initial values, and the rate of decay was 5.5% (95% CI, 2.4–8.4) per week. The frequencies of T cells specific for each of the peptides declined in parallel, but only the summated responses to all ESAT-6-derived peptides are shown for clarity (Fig. 2⇓). Frequencies of ESAT-6 peptide-specific IFN-γ-secreting T cells decline with antituberculous chemotherapy (p = 0.005; n = 12). The summated number of ESAT-6 peptide-specific T cells for each patient was enumerated by ex vivo ELISPOT at various time points during the course of therapy. The figure shows the percentage of ESAT-6-specific T cells remaining at various time points relative to the original number of ESAT-6-specific T cells at the time at which the patient was first tested. The initial time point was within 5 wk of starting treatment for all patients, except NPH252, who was first sampled at 19 wk into therapy. The median frequency of ESAT-6-specific T cells at the initial time point was 287/million PBMC (range, 90–3637). The overall frequency of ESAT-6 peptide-specific IFN-γ-secreting T cells fell, on average, by a factor of 0.62 (95% CI, 0.37–0.76) (that is, to 38% of the initial values) over the time period shown. The average rate of decay was 5.5% (95% CI, 2.4–8.4) per week. This decline was observed for all groups of patients followed up: C+PTB (n = 4); TBLN (n = 3); and EPTB (miliary, n = 1; pleural, n = 2, osteomyelitis, n = 1). 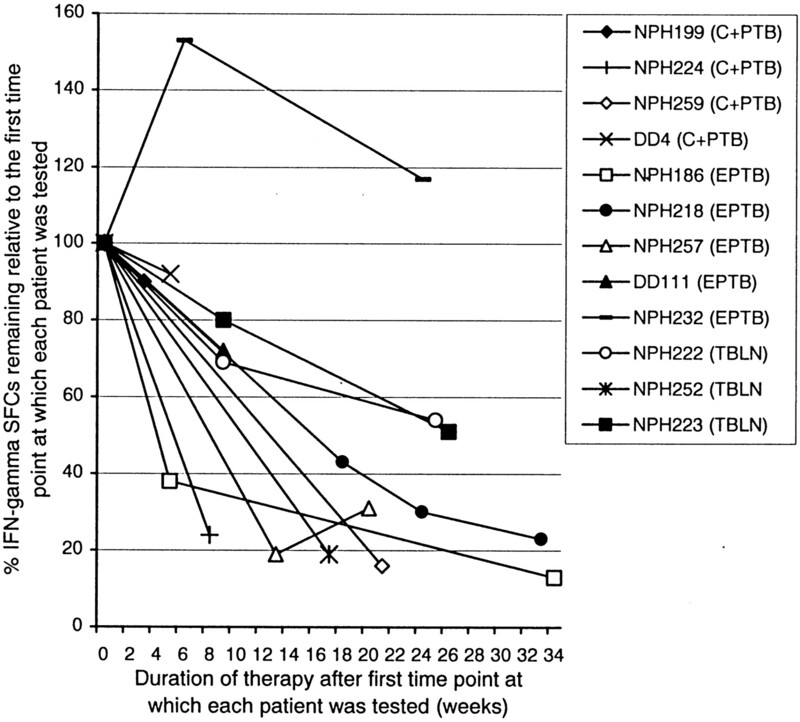 For one EPTB patient (NPH232, miliary), the T cell frequency initially rose, then declined. The median frequency of ESAT-6-specific T cells at the final time point was 102/million PBMC (range, 33–1843). Using the ex vivo ELISPOT assay, each of the overlapping ESAT-6-derived 15-mer peptides was recognized by IFN-γ-secreting T cells from one or more of 88 tuberculosis patients and contacts tested (Fig. 3⇓). 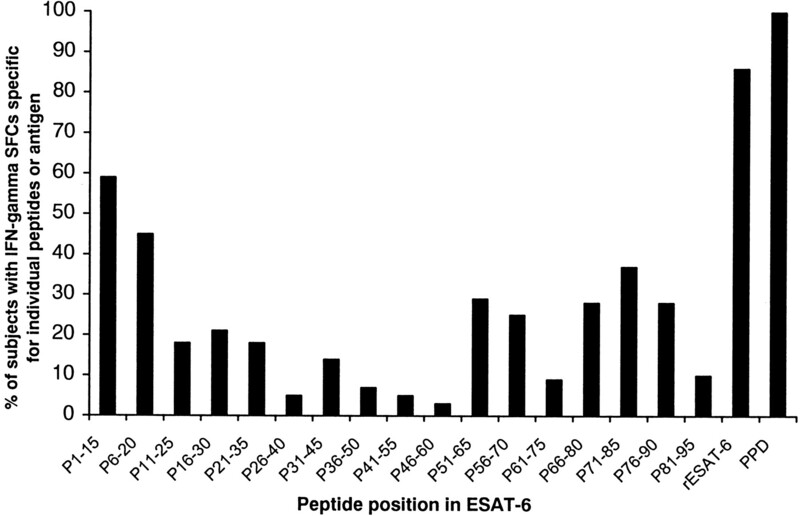 In this population, peptides ESAT-61–15, ESAT-66–20, and ESAT-671–85 were particularly widely recognized by 59%, 45%, and 37% of subjects, respectively. CD4 epitope map of ESAT-6 as defined by ex vivo peptide-specific IFN-γ ELISPOT responses for all 88 tuberculosis patients and contacts. The percentage of subjects that responded to each peptide is shown, and in each case 88 subjects were tested against each peptide. For rESAT-6 Ag, 35 tuberculosis patients and contacts were tested. Fifty-nine T cell lines were generated from several patients and HHCs against 15 ESAT-6-derived peptides. After 12 days of culture with IL-2 supplementation, ELISPOT assays were performed before and after immunomagnetic depletion of CD4 or CD8 T cells. For 55 of 59 T cell lines, peptide-specific responses were abrogated by CD4 depletion (Table II⇓); 4 T cell lines specific for certain peptides were CD8 positive (7, 39). A response in the ex vivo ELISPOT assay for IFN-γ indicates T cell-mediated IFN-γ-secretion within 14 h of exposure to peptide. To establish how quickly these T cells can release IFN-γ upon Ag encounter, we conducted 6-h ex vivo ELISPOT assays in three subjects (two HHCs and one C−PTB) with 11 peptides. In each case, IFN-γ SFCs were readily detected at 6 h to all the peptides that gave a response at 14 h (data not shown). The frequency of peptide-specific IFN-γ-secreting T cells enumerated at 6 h was 80–90% of that at 14 h, indicating that ESAT-6 peptide-specific T cells can secrete IFN-γ within 6 h of Ag contact, and are thus capable of rapid effector function (37). Using PBMC from 15 subjects, lymphoproliferation assays were performed in parallel to ex vivo IFN-γ ELISPOT assays using 16 different peptides. Surprisingly, we did not detect proliferation to peptides ESAT-61–15 and ESAT-671–85 in several subjects with IFN-γ-secreting T cells specific for these peptides in the ex vivo ELISPOT (Table II⇑). Twelve subjects responded to ESAT-61–15 by ex vivo ELISPOT (mean peptide-specific IFN-γ SFCs for responders, 77/106 PBMC (IQ range, 38–100)) compared with only three by lymphoproliferation. For ESAT-671–85, 10 subjects responded by ex vivo ELISPOT (mean peptide-specific IFN-γ SFCs for responders, 121/106 PBMC (IQ range, 65–171)) compared with 5 by lymphoproliferation. However, lymphoproliferative responses to the positive control, PPD, were strong: mean stimulation index, 82 (IQ range, 35–98). Nonetheless, peptide-specific T cell lines were readily generated by peptide stimulation in vitro with IL-2 supplementation; thus, these ESAT-6 peptide-specific T cells, while displaying rapid effector function upon Ag contact, do not proliferate in vitro in the absence of exogenous IL-2. For several other peptides, however, there was a broad concordance between the two assays (Table II⇑). We were interested to determine the MHC restriction of the two peptides that were immunodominant by ex vivo ELISPOT but gave discrepant results in lymphoproliferation assays. We used mAbs to block presentation of peptide to T cell lines and ex vivo PBMC in ELISPOT assays. For ESAT-61–15, in all three individuals tested, IFN-γ SFCs were markedly diminished by anti-HLA-DQ Ab, but not by Abs to HLA-DR or HLA-DP (Fig. 4⇓A–C). For ESAT-671–85, two individuals were tested, and in both cases, the response was blocked only by the anti-HLA-DQ Ab (Fig. 4⇓, D and E). In contrast, ex vivo ELISPOT responses to the other peptides tested (ESAT-66–20, ESAT-651–65, ESAT-666–80, and ESAT-676–90) were shown to be HLA-DR restricted (data not shown). CD4 T cell responses to the immunodominant epitopes ESAT-61–15 and ESAT-671–85 are HLA-DQ restricted. IFN-γ SFCs specific for peptides ESAT-61–15 (A–C) and ESAT-671–85 (D and E) are markedly diminished by anti-HLA-DQ Ab, but not by Abs to HLA-DR or HLA-DP. For ESAT-61–15, results are shown for ex vivo PBMC from healthy contact NPH209 (A), ESAT-61–15-specific T cell line from healthy contact GM19 (B), and ESAT-61–15-specific T cell line from TBLN patient NPH223 (C). For ESAT-671–85, results are shown for ex vivo PBMC from healthy contact GM19 (D) and from TBLN patient NPH223 (E). In each case, the frequency of IFN-γ SFCs shown is the mean for two duplicate wells. In 35 subjects (28 patients and 7 HHCs), rESAT-6 Ag was tested in the ex vivo ELISPOT assays in parallel with ESAT-6 peptides, and 30 of 35 (86%) responded to rESAT-6 (Fig. 3⇑). The 5 subjects who did not respond to the protein were subjects who also failed to respond to any of the 17 peptides. Thus, of 30 patients who responded to one or more peptides, all responded to rESAT-6 Ag, indicating that rESAT-6 is processed and presented to T cells in the ex vivo ELISPOT assay. Freshly isolated PBMC from eight tuberculosis patients (four C+PTB and four EPTB) and eight HHCs were tested ex vivo against all 17 ESAT-6-derived peptides in an ELISPOT assay for IL-4 in parallel with the ELISPOT assay for IFN-γ. The numbers of SFCs were summated for each peptide. Among the tuberculosis patients, eight of eight had ESAT-6 peptide-specific IFN-γ-secreting T cells (mean, 425 IFN-γ SFCs/million PBMC), while zero of eight had ESAT-6 peptide-specific IL-4-secreting T cells. For the HHCs, six of eight responded in the IFN-γ ELISPOT assay (mean frequency in responders, 414 ESAT-6 peptide-specific IFN-γ SFCs/million PBMC) compared with two of eight responders in the IL-4 ELISPOT assay (mean frequency in responders, 93 ESAT-6 peptide-specific IFN-γ SFCs/million PBMC). Both the contacts who responded in the IL-4 ELISPOT assay also responded in the IFN-γ ELISPOT assay. Positive controls for IFN-γ and IL-4 ELISPOT assays with PHA stimulation were always over 500 IFN-γ or IL-4 SFCs/106 PBMC, respectively (data not shown). By direct ex vivo analysis, we have characterized a population of Ag-specific IFN-γ-secreting CD4 T cells that circulate in the blood of almost all M. tuberculosis-infected individuals, but are absent in unexposed, BCG-vaccinated controls. The presence of circulating IFN-γ-secreting ESAT-6-specific CD4 T cells in PPD-positive, latently infected HHCs, who were clinically and radiographically free of disease, indicates that these T cells are not necessarily associated with tissue pathology per se. Rather, their presence in these individuals may be consistent with a role in the containment of M. tuberculosis in vivo. This hypothesis is supported by the observation that ESAT-6-specific CD4 T cells circulate at higher frequencies in HHCs than in C+PTB patients (Fig. 1⇑). Among subgroups of tuberculosis patients, the frequency of these T cells was higher in those groups who manifest relatively more successful containment of M. tuberculosis in vivo. Thus, TBLN patients (with highly localized disease, minimal symptoms, and frequent spontaneous resolution) and self-healed C−PTB patients (with no symptoms and no evidence of ongoing bacterial replication in multiple clinical specimens) both had higher frequencies of ESAT-6-specific CD4 T cells than C+PTB patients with M. tuberculosis actively growing in respiratory secretions (Table I⇑ and Fig. 1⇑). However, active tuberculosis causes an ill-defined nonspecific immunosuppression. It is therefore possible that immune responses that are weaker in patients with more extensive active disease than in patients with minimal disease are merely secondarily suppressed as a consequence of active tuberculosis itself. If this were the case, immune responses should rise with treatment and, in general, Ag-stimulated or PPD-stimulated IFN-γ secretion from cultured PBMC and lymphoproliferative responses do increase during antituberculous therapy (28, 29, 30, 40, 41). However, longitudinal follow-up of tuberculosis patients with the ex vivo ELISPOT assay showed that the frequency of ESAT-6-specific IFN-γ-secreting CD4 T cells actually fell during therapy (p = 0.005) (Fig. 2⇑). This indicates that the lower frequency of ESAT-6-specific T cells in patients with more extensive disease is not a secondary effect of disease-related immunosuppression nor a result of sequestration of M. tuberculosis-specific T cells at sites of active disease. Rather, the decline in ESAT-6-specific T cells with therapy, which reduces bacterial load by several orders of magnitude, suggests that, within a given individual, the frequency of ESAT-6-specific T cells is related to Ag load. This observation was made possible by using an assay that directly quantitates Ag-specific T cells without involving in vitro proliferation (33, 37, 38). Our finding is somewhat analogous to the decay in virus-specific CD8 and CD4 T cell frequencies, directly enumerated from peripheral blood, in HIV-infected patients during combination antiretroviral therapy (31, 32, 34) and, in general for intracellular pathogens, frequencies of Ag-specific T cells, when directly quantitated ex vivo, appear to be driven by Ag load (33, 42, 43). Although there is no quantitative absolute measure of bacterial or Ag load in tuberculosis, they must be directly and closely interrelated. Ag load is almost certainly much lower in HHCs than in patients and, among patients, will obviously be lower in TBLN patients and C−PTB patients than in C+PTB patients. Given that Ag load would be expected to drive ESAT-6-specific CD4 T cell frequencies, it is remarkable that the M. tuberculosis-infected subjects with lower Ag loads have higher levels of ESAT-6-specific CD4 T cells. This inverse correlation is similar to that observed for virus-specific CD8 T cell frequencies and plasma viral load in HIV-infected patients (31), a finding that provided important support for the protective role of CD8 T cells in control of HIV and that depended crucially upon a means to quantify Ag-specific T cells directly ex vivo (33, 38). Thus, consideration of the frequencies of ESAT-6-specific T cells in the context of the differing bacterial load in the different groups of M. tuberculosis-infected subjects lends further support to the hypothesis that these T cells mediate containment of M. tuberculosis in vivo. All groups of patients had similar proportions of individuals who had undergone treatment except for the HHCs, none of whom had received chemoprophylaxis. Moreover, the effect of treatment on ESAT-6 peptide-specific T cell frequencies appears to be similar for all groups of patients followed up (Fig. 2⇑). Thus, the differences in ESAT-6-specific CD4 T cell frequencies between the three groups of patients are unlikely to result from differences in duration of treatment, although this may not apply to the HHCs. Our interpretation of these findings is that, at the time of initial infection with M. tuberculosis, HHCs mount a strong, high frequency Th1-type CD4 T cell response to M. tuberculosis and, in particular, to ESAT-6, and so help to limit bacterial replication. Individuals who go on to develop active disease, in contrast, make a weak CD4 T cell response, and the bacteria are allowed to reach a higher equilibrium bacterial load, resulting in disease. Thus, HHCs maintain a high frequency of ESAT-6-specific CD4 T cells with limited antigenic stimulation from a low bacterial load, while in C+PTB patients, a high bacterial load stimulates weaker, less efficient proliferation of Ag-specific CD4 T cells in vivo. This model is analogous to that proposed for certain chronic viral infections, in which virus-specific CD8 T cells are believed to mediate protective immunity (44). The difference between HHCs and PTB patients may lie in an individual’s T cell responsiveness, which has previously been defined as the rate at which pathogen-specific T cells proliferate in vivo after encountering an infected host cell (44). Indeed, the early emergence and efficient proliferation of IFN-γ-secreting CD4 T cells in vivo have recently been identified as crucial factors in the early containment of mycobacterial infection in murine models (1, 45, 46). ESAT-6 contains multiple CD4 T cell epitopes, as previously described (19, 47). Fig. 3⇑ shows that several ESAT-6-derived peptides are widely recognized by T cells from an ethnically and genetically diverse range of patients and HHCs, suggesting that these peptides may be permissively restricted by a wide range of HLA class II haplotypes. The hierarchy of immunodominance using the ex vivo ELISPOT assay (Fig. 3⇑) is quite different to that reported by others using more conventional assays that depend on in vitro proliferation (19). In particular, the striking immunodominance of peptides ESAT-61–15 and ESAT-671–85 has not been previously recognized with other assays, and might reflect the fact that the ex vivo ELISPOT assay can detect T cells that do not proliferate well in vitro (33, 37). We therefore tested these, and the other ESAT-6-derived peptides, for their ability to stimulate T cells in lymphoproliferation assays. Although for most peptides there was a broad concordance between T cell responses in these assays and in the ex vivo ELISPOT, for peptides ESAT-61–15 and ESAT-671–85 there was a marked discrepancy (Table II⇑). The impaired ability of ESAT-61–15-specific and ESAT-671–85-specific T cells to proliferate in vitro probably explains why the immunodominance of these peptides was not hitherto fully appreciated. Interestingly, however, these T cells did proliferate in vitro if stimulated with IL-2 as well as peptide. Because peptides ESAT-61–15 and ESAT-671–85 are recognized ex vivo by T cells from a very high proportion of M. tuberculosis-infected subjects, their HLA restriction is of special interest. Immunodominant, permissively restricted CD4 epitopes are usually HLA-DR restricted, and this is the case in tuberculosis (48). Surprisingly, peptides ESAT-61–15 and ESAT-671–85 were shown to be HLA-DQ restricted in ELISPOT assays (Fig. 4⇑). These are, to our knowledge, the first immunodominant HLA-DQ-restricted mycobacterial epitopes to be identified. Having found that most M. tuberculosis-infected individuals have high frequencies of ESAT-6-specific IFN-γ-secreting CD4 T cells, we asked whether ESAT-6-specific Th2-type CD4 T cells are also induced to a similar extent. Ex vivo ELISPOT assays for IL-4 in a subset of patients and HHCs showed that, in contrast to the almost universal presence of ESAT-6-specific IFN-γ-secreting T cells in M. tuberculosis-infected subjects, IL-4-secreting T cells specific for ESAT-6 are rare. ESAT-6-specific CD4 T cells induced by natural M. tuberculosis infection thus have a highly Th1-polarized pattern of cytokine secretion. We have identified a population of circulating IFN-γ-secreting M. tuberculosis Ag-specific CD4 T cells that circulate at high frequencies in asymptomatic individuals with latent M. tuberculosis infection, as well as tuberculosis patients. Our direct quantitative ex vivo approach led to certain key findings that have not been recognized using previous assays. Unlike other cellular immune responses in tuberculosis, frequencies of ESAT-6-specific CD4 T cells decay progressively with treatment, suggesting that these T cell frequencies are driven, at least in part, by Ag load. Therefore, patients with more extensive disease and higher bacterial loads would be expected to have the highest Ag-specific T cell frequencies. However, we observed the opposite: between groups of tuberculosis patients, the frequencies of these T cells appear to correlate inversely with inferred bacterial load. These findings are consistent with a role for this population of Th1-type Ag-specific CD4 T cells in the containment of M. tuberculosis in vivo. These results, together with the fact that ESAT-6 contains multiple CD8 T cell epitopes (7, 39), suggest that this Ag may be a target of protective immune responses in M. tuberculosis-infected humans; its absence from M. bovis BCG (23, 24) might thus account, in part, for the limited efficacy of BCG vaccination. Our findings thus support the development of an ESAT-6-based tuberculosis subunit vaccine that aims to induce Th1-type CD4 and CD8 T cells. Such a vaccine would, however, limit the clinical utility of ESAT-6-specific T cell responses as a diagnostic marker for M. tuberculosis infection; these potentially contrasting roles for ESAT-6 will need to be reconciled over the next few years. Finally, the decay of ESAT-6-specific CD4 T cells in the ex vivo ELISPOT during effective antituberculous chemotherapy may suggest a novel approach for monitoring the efficacy of new pharmacological or immunological interventions for tuberculosis. We thank all patients, contacts, and unexposed donors for participating in the study. We thank the staff of the Lister Unit and Contact Tracing Clinic at Northwick Park Hospital, especially Helen Durkan, Mohammed Latif, Mark Harries, Robert Wall, Dina Shah, Divya Gudka, Bina Bhandari, Marion Davies, Janet Chater, and Jackie Hewlett. We are grateful to Charles Bangham, Nick Wilcox, Robert Wilkinson, and Andrew McMichael for helpful discussions and critical review of the manuscript. We also thank Shabbar Jaffar and William Reece for statistical help. We are grateful to Stippo Jurcevic for the kind gift of the anti-HLA class II Abs. ↵1 This work was supported by the Wellcome Trust. ↵3 Abbreviations used in this paper: BCG, bacillus Calmette-Guérin; C+PTB, culture-positive pulmonary tuberculosis; C−PTB, culture-negative pulmonary tuberculosis; CI, confidence interval; EPTB, extrapulmonary tuberculosis; HHC, healthy household contact; PPD, purified protein derivative; SFC, spot-forming cell; TBLN, tuberculous lymphadenitis; TST, tuberculin skin test; UC, unexposed control. Lundin, K. E. A., L. M. Sollid, E. Thorsby. 1996. Class II-restricted T cell function. M. J. Browning, and A. J. McMichael, eds. HLA and MHC: Genes, Molecules and Function 329 BIOS Scientific, Oxford.